Colbert, to AOC: "How Many F---s Do You Give About the Democratic Establishment?" 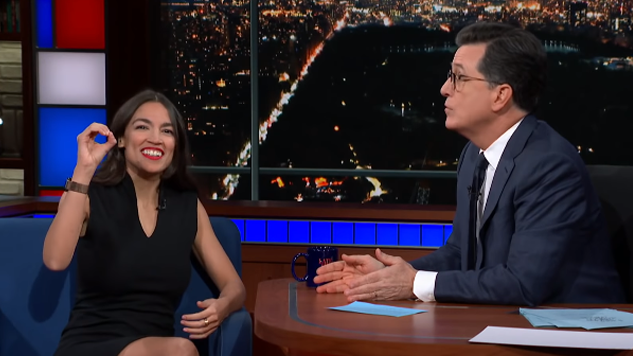 AOC: "Zero"
Rep. Alexandria Ocasio-Cortez’s appearance on The Late Show with Stephen Colbert Monday night bolstered her grassroots cred, as the Democrat reiterated that she doesn’t care about pushback from the party establishment. “I think it’s um, zero,” the New Yorker said with a laugh, miming a big, fat goose-egg. Disapproval has emerged from her own party after Ocasio-Cortez said she’d back opponents of incumbent Democrats she regards as too moderate. Her open criticism of the new set of House rules on Twitter also drew raised eyebrows from fellow Dems. “I’m sure Ms. Cortez means well, but there’s almost an outstanding rule: Don’t attack your own people. We just don’t need sniping in our Democratic Caucus,” Rep. Emanuel Cleaver (D-Mo.) told Politico. When asked by Colbert what she would say to those who condemn her lack of party unity, Ocasio-Cortez responded that it depends on whether or not you interpret activism as “inherently divisive.” She invoked Dr. Martin Luther King, Jr. (apt, considering the holiday), saying he proved controversial and quite unpopular in his time while championing the Civil Rights Act. “I think that what we really need to realize is that social movements are the moral compass and should be the moral compass of our politics,” the politician stated. The rest of her time on the show was spent shifting that pesky Overton Window to the left (her work on that is explained in more detail by Paste’s Jacob Weindling here) as she explained the 70 percent marginal tax rate and openly embraced the label “Democratic socialist.” Watch Ocasio-Cortez give zero f***s below.